Konami US has been depressingly quiet about the prospects of making Suikoden more accessible to modern gamers, but at least the company's UK branch is showing their best franchise some love. Today on the Konami UK blog there's a big post about Suikoden, written by the folks at the Suikoden Revival Movement. Progress! We love our communities, and often find ourselves overwhelmed by the enthusiasm, passion and creativity shown off by fans of our many game series. One such group is the increasingly popular Suikoden Revival Movement that forms a base which fans of the classic Suikoden RPG games can discuss the past, present and future of the series whilst also showing off some truly epic fan-art and cosplay. 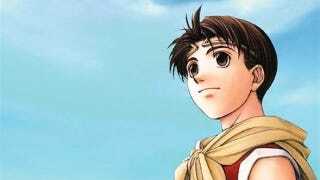 The main aim of the movement however is to bring Suikoden back into the consciousness of the wider gaming community so that a wider audience can celebrate the game. Although the last Suikoden game was released in the UK way back in 2006, the group still strives to achieve their goal posting regular articles and holding frequent competitons for members to engage with. As such, we decided to give them the floor to explain why Suikoden is so close to their hearts, why it stands out among other games and why it should be offered to a much wider audience. Below is how they responded. And you can read the whole thing on Konami's blog. Of course, Suikoden still isn't on PSN in Europe, Suikoden II still isn't on PSN anywhere, and the most recent Suikoden spinoff is never coming to the United States. But hey, at least Konami UK remembers that the series exists. With the US branch, all we get is... a tweet. About Metal Gear Solid. Bummer.